Life and times of an independent researcher: Publish or be damned? Posted on June 8, 2016 by academicbookfuture	in authors, publishing, research and tagged Catherine White, crossover book, independent research, interdisciplinary, May Morris. This guest post is written by Catherine White, an independent researcher currently writing a biography on May Morris – the daughter of William Morris, Pre-Raphaelite, Socialist, and leader of the Arts & Crafts Movement. Catherine met the Project’s Research Associate, Rebecca Lyons, at the recent two-day conference on May Morris, co-organised by the V&A’s Clothworkers’ Centre, The William Morris Society, and the William Morris Gallery. Catherine’s experience of writing a distinctly interdisciplinary crossover book (i.e. one with appeal to both academia and the general public, and which crosses several areas of interest) and searching for a publisher whilst both an independent researcher and a new mother touches upon several key areas of the Project. Here she openly shares that experience. 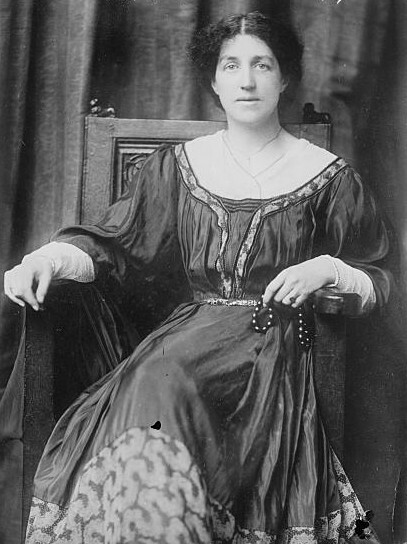 Image of May Morris from the George Grantham Bain collection at the Library of Congress. In 2011, I saw a reference to May Morris. I had studied the Pre-Raphaelites and their circle for my Art History degree but had never come across her before. I subsequently found out she was a designer, embroiderer, jewellery-maker, writer, Socialist, part of the Arts & Crafts movement, and the daughter of William Morris. I was hooked. There has never been a sole biography of May, and so I decided that I would write one. Just after this, by sheer coincidence, I was introduced to a lady whose great aunt had worked for May Morris. She has generously allowed me to research her family archive, which contains an unpublished memoir and letters – and the rest is (art) history. At the time I had a young daughter at home, and I took the chance to read as much as I could, whenever I could, to prepare for writing the book. Thanks to the wonder of the internet, any second-hand book I wanted to order could be delivered to my door. For those that were outrageously priced, I discovered that I could order in books from the British Library to my local library. Once my daughter started preschool, I used the two mornings a week to write. It was occasionally frustrating to have to leave a section mid-sentence, but it was mainly beneficial to have thinking time between each instalment. I recently came across a book called The Ladybird book of The Mid-life Crisis (Michael Joseph 2015), which had an illustration with the text caption of ‘Gwen has a 2:1 in Ancient History. She always planned to write a series of novels about Boadicea. Gwen is covered in apple sauce and has spent the afternoon clapping.’ Luckily it proved possible to combine the two (apple sauce and the book). It doesn’t seem to have done my daughter any harm, except that she has grown up sure that May Morris must be part of our family somehow. In 2013, I approached my first publisher. Whilst knowing this would not be easy, I was fairly hopeful that the book was an attractive proposition because it was intended for a general rather than a specific audience. Although it is footnoted, and has unpublished information of interest to the academic community, May’s life has an appeal for a much wider audience, including those interested in the Pre-Raphaelites, the Arts & Crafts Movement, or social and political history, including the changing role of women – plus did I mention that May had a significant liaison with George Bernard Shaw? Yet this concept has actually brought its own challenges because it does not fit in a traditional publishing box. Publishers have expressed an interest in the proposal, but so far say that it doesn’t quite fit with their catalogue. It appears that academic publishers are more interested in a sole subject book, but this is not a purely academic book. I want this book to be accessible because it has such a great story to tell. An academic price tag of perhaps £50 or more would take it out of the reach of my core audience; those having heard of May Morris, or visiting an historic house associated with her, are unlikely to make such a purchase on a whim. General interest publishers could make this book affordable, but seem more wary of investing in a book on the single subject of May. My other problem is that this book has to be illustrated. May Morris was responsible for making exquisite textiles and jewellery, and these have to be included, and in colour – which doubles the cost of production. This cost also means that self-publishing isn’t viable, nor was the offer from a publisher (my favourite rejection to date) who said they would publish it if I found £10,000 or a gallery willing to purchase 1000 copies of my book! So where does this leave me? I am continuing to write the book, of course, and continuing to submit it to publishers. Finding a publisher has never been easy, and even May Morris despaired of finding one for her final book, which was eventually produced in 1936, just two years before her death. Overall, so far, I do not feel my book has suffered from not having a confirmed publisher; it has meant it could evolve at its own pace without the pressure of a deadline. There is a tipping point on the horizon though, which is a major May Morris exhibition planned by the William Morris Gallery in the autumn of 2017. Confirming a publisher now would enable me to prioritise my writing and aim for completion in time for the exhibition, but without one, I need to continue to combine writing with other work. But watch this (hopefully book-shaped) space!